Futurist Daniel Burrus lists Fiber-Reinforced Composites (more commonly known as Fiber-Reinforced Plastic or FRP) as one of the top twenty core technologies that will shape the future. In company with FRC are genetic engineering, superconductors, thin-film deposition and so on. Among the top twenty core technologies, FRC is the only one you can use in your own little shop, for really important things like your boat or similar hobbies. In the last decade, we have seen a proliferation of FRC. We find them at race tracks, ski slopes, football fields, marinas and outer space. They’re used to construct complete structures or crucial components of diverse products such as radio controlled airplanes, Formula One race cars and sailboards. They’re used primarily because they offer a light weight structural advantage, but now, a decorative appeal as well. They’ve become a fashion statement! The clear resin cast about black graphite or golden Kevlar™ fibers offers a uniquely attractive, high-tech look. Helmets, goggles, purses and motorcycle components are examples where “the look” adds a premium to the product’s value. A composite is a combination of two or more materials, joined to result in an end product with better physical properties than the individual materials standing alone. The material generally known as “fiberglass” is an FRC. 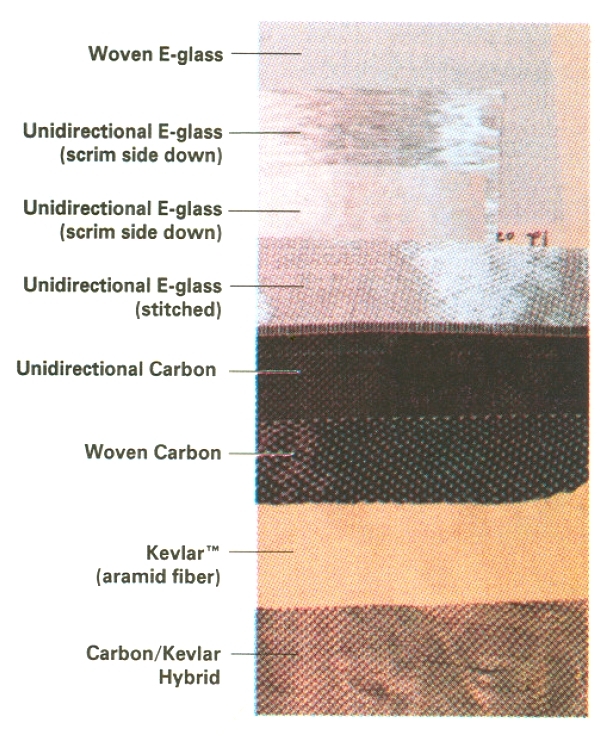 Developed about 1937, fiberglass is an assembly of glass fibers frozen to shape with a resin— or as the name implies, resin cast into a shape and reinforced with fibers. Fiber-Reinforced Composites offer excellent strength-to-weight ratios. They are very stiff, dimensionally stable and corrosion resistant. They are moldable to nearly any shape and are easy to repair. The cost of producing them continues to decrease over time. However, they can lack hardness and can be scratched. They’re not always the best choice where a lot of abrasion is expected. Fiber type and quality, fiber orientation, resin selection, the proportion of resin and fiber and assembly procedures all affect the end product. Some fibers have better physical properties than others. Some stretch less before reaching their maximum strength (modulus). Some may be finer, thus may offer more fibers per-unit. 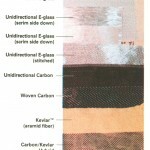 E-glass (electrical grade) is by far the most common reinforcing fiber choice. Originally used for its electrical insulation properties, E-glass fabrics have good stiffness and strength properties and are the least expensive reinforcing fabric. S-glass has better physical properties than E-glass, because of the composition of the glass the filaments are drawn from and in part, because it has finer filaments than E-glass. Thus, S-glass has more strands per unit than E-glass and more surface area in contact with resin. You can’t tell E-glass and S-glass apart by simply looking at them. They’re both white, and like most glass fabrics, both become nearly transparent when wet out with resin. Naturally, S-glass costs more than E-glass. A trademark of DuPont, Kevlar is the tradename for aramid fibers, a form of nylon. Kevlar is a yellow/golden color. It is a good choice when high tensile strength and impact resistance are required, but not when compressive strength is desired. Carbon (graphite) fiber is easy to spot, it looks just like E-glass but is black. Its fine fibers have high modulus in tension and compression. Carbon fiber is use where stiffness, strength and light weight are most important. However, carbon fiber laminates have low impact resistance. Some FRC structures benefit from a combination of reinforcing materials, or a hybrid. Each material contributes its best qualities to the structure and can compensate for the weakness of another material. For example, the safety cell in a race car, which holds the driver, is a monocoque structure fabricated of carbon fiber and Kevlar. Typically, the outer surface of the laminate is carbon fiber, for strength and stiffness. But carbon fiber shatters into sharp splinters on sufficient impact. So the inner surface of the safety cell is composed of Kevlar, which fails in a crush mode. The crushing Kevlar protects the driver from the shattering carbon, much like a cloth bag would protect your hand as you crush a light bulb. To help builders address predicted load directions, fiber manufacturers offer a variety of styles; uni-directional, bi-directional, biaxial, triaxial, woven and so on. Fiber orientation is important in determining a laminate’s strength and stiffness. The builder should select the type of weave and orient the fibers to best address the direction of the loads within the structure—just as one would when building a wooden structure. It’s easier to figure out what the load direction will be for some structures than it is for others. For example, we’d expect a simple cantilevered beam to be exposed to tension on the top and compression on the bottom, with the loads passing in one direction. Therefore, a uni-directional fabric would be appropriate. Structures that may be exposed to less predictable loads may be better off with a laminate that addresses loads in multiple directions. Just as there is a difference in fibers, there is a difference in resins. Different resins offer trade-offs in performance characteristics. Polyester resins work quite well for general fiberglass boat production and are cheaper than epoxies. The trade offs are that polyester has comparatively poor physical properties, a short shelf-life and is a poor adhesive. They also contain a large amount of solvents or Volatile Organic Compounds (VOC’s), making them unpleasant to work with. Epoxy’s physical properties are much higher than polyester resin. It makes sense to use epoxy rather than polyester when working with high-performance reinforcing fibers. Epoxy such as WEST SYSTEM will cure fully at room temperature. Best of all, you can use it without a lot of special equipment. This has made epoxies a favorite choice of both professional and casual builders of all kinds of high-performance composites. The physical properties of some epoxies improve with post-curing, the process of elevating the temperature of the laminate after an initial room temperature cure. Some of the highest performance resins are available in pre-preg form. A pre-preg manufacturer impregnates a particular fabric with a resin that does not cure until it is heated. This allows nearly indefinite working time and is easy to handle; nearly like working with dry material. The trade-off for this high performance and easy handling is that these materials usually must be stored in a freezer until used, then heated to 200°F or more to initiate a cure. This calls for lots of freezer space and an oven bigger than the part you’re building. Pre-pregs are also very expensive as a rule, and prone to failure if not assembled with great care. Therefore, scrap rates can be high. The reinforcing fibers used with a resin will have a profound effect on that resin’s physical properties. Some resin manufactures provide physical properties data for their resin modified with reinforcing fiber. This will not give you an accurate picture of the performance you should expect if you are using that resin with a different reinforcing fiber. When comparing resins, always compare apples to apples by looking only at physical properties data for neat resins (without fillers or fibers added). Some manufacturers post-cure samples before testing. So, check the cure temperature when comparing physical properties. In sandwich construction fiber reinforced resin serves as the structural skin of a part. Separating two structural skins with a core material will improve the composite’s stiffness and reduce weight, much like the web of an I-beam separates the flanges. 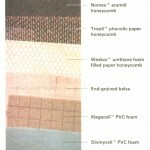 Cores can be of plywood, end-grain balsa, foam or honeycomb. Normally, the core is much lighter than the skin material. Like most materials, different cores have advantages and disadvantages. Loads tend to concentrate at the load bearing skin/core interface, so low-strength cores are prone to shear failure. Cores are low in density and tend to insulate the laminate. This can be detrimental as heat concentrates on the skin, softening the resin or causing adhesion problems between the skin and core. To facilitate assembly around curved surfaces, cores are often grid-scored. As the core passes around curves, the grid score opens. If not filled, the open score may act as a conduit for moisture passage. In the contact molding (wet lay-up) method, the fibers are wet by pouring, rolling or brushing resin onto the fabric. Then a squeegee or spreader is used to move the resin and remove excess resin from the fibers. An impregnator is a device that applies a controlled amount of resin to the fabric by passing it between rollers. It’s used in larger productions operations where assembly time is critical. A release fabric can be used to protect the reinforcing fibers from disturbance when squeegeeing, thereby permitting more pressure and achieving a lower resin content. Release fabrics can also allow for secondary bonding without additional surface preparation. One simply strips the release fabric from the cured surface. A typical lay-up relies on gravity to hold the materials together until the resin cures. Most composites can benefit from vacuum bagging, a clamping method used reduce the resin content, compact the reinforcing fiber bundles and densify the laminate. Vacuum bagging allows you to achieve more favorable resin-to-fiber ratios than you can by removing excess resin with a squeegee. Generally speaking, a 50:50 resin-to-fiber ratio is pretty good. Excess resin does little to improve a composite’s physical properties, and it adds weight and expense. Vacuum Bagging permits substantial and equal distribution of pressure on the laminate as it cures. The laminate is placed on a mold, (inside an airtight vacuum bag). A vacuum pump is then used to remove the air from the bag and atmospheric pressure forces the laminate against the mold with firm and even pressure. This kind of equal pressure is crucial to achieve consistent contact when cores are placed between structural skins. For home projects, you can achieve effective vacuum pressure of 6 to 10 p.s.i. with a small pump. There are numerous ways to control and optimize vacuum pressure. These are detailed in our manual Vacuum Bagging Techniques. Variations of vacuum bagging can include use of a caul—a solid cover over the laminate that forms a specific shape or profile to the top side of the laminate. Many of the materials and methods used to fabricate Fiber-Reinforced Composites are within the reach of the home shop. It’s fun to be part of the cutting edge. In many instances, you can produce some impressively light, strong FRC structures. If you have a youngster, chances are hands-on experience with this core technology of the future will hold intrinsic value to the protégé. This entry was posted in Composite Fabrication and tagged #9, Captain James R. Watson, Epoxyworks #9, FRP, Spring 1997 on June 28, 2014 by ewadmin.